On Wednesday night at the Enterprise Center, Shania Twain showed that while she may be on her farewell tour, she still has some gas left in the tank. The once queen of country music brought a crowd of 12,000 fans to their feet several times throughout the evening. 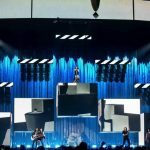 Even though Shania may be on her “farewell” tour, the singer has a new album, “Now,” which she performed from during the show. Playing for right around 2 hours, Twain pulled out all the hits from her 5 albums. For a singer who seems to have been around for a long time, it’s hard to believe she’s only released 5 albums, but nonetheless, Twain has the arsenal of hits to pull off a 2-hour tour de force. While some country acts keep it simple, Twain opted for a moving stage and a plethora of backup dancers. Twain’s band was also top-notch. After seeing Twain’s show on Wednesday night, I’d be shocked if this is truly her final tour. The country singer has too many hits and too much star power to give up touring all together. Twain’s show gets an A-.